work is. I’m just keeping on top of it and doing it all well. Scotty and I had a wonderful valentines. Friday night on the way home from work I popped in to the local beauty place and booked in a massage amazingly for 9.10 am on Saturday. I told Scotty when I got in, he said it was a perfect valentines gift and promptly paid for it. Hoorah! Saturday we went shopping for HOURS. Stopped off for a pret lunch and succeeded in purchasing clothes for the both of us. Firstly I purchased hopefully my last knitting book for some time. I think I have everything I need now to get something knitted. Shame that I’ve not picked up the needles since last weeks knitting club. *le sigh* my mojo has taken a sabatical and not informed me. I purchased 3 new skirts, 3 new tops and a pair of trousers. Got them all home and tried them on and they all fit fine. Except one skirt zip was broken. Scotty got two new work shirts. In the useful things I need department we bought a garlic press. One with a rubbery side to clean it, it works. We’ve had garlic nearly every day this week so I could thoroughly test it. Sunday, Scotty made more fresh bread and I started on the home paperwork. It is still lying in a mess on the spare room table down stairs. I “borrowed” or liberated some old folders from the office to re-file and start from fresh with some of our personal data, like bank accounts, bills, all that TON of paperwork that accumulates enough to make a large bonfire. All recycled including the work folders. Monday I had lunch with a work friend. 5 years doing the same job in the same team and I’d never met him. We got on well but we’ve been chatting like mates for years anyway. I also took back broken skirt. Wednesday I was meant to meet Dad for lunch but I had to cancel. Good job because he was helping my sister after she’s just moved house. They have been waiting months to move and are also waiting on a new puppy to arrive. They have completed and moved just in time. New puppy arrives on Friday YAY! I went to put on my new posh trousers for work and bent over to stroke Jasper. *rip* the bottom fell out of my world, or at least I was gaping where a woman should never gape. *sigh* Trousers changed and left on the bed to be coated in cat hair before taking them back. Thursday Dad did pop over but we only got to chat fo 15 minutes or so. It was nice to see him before he went away for the weekend. He’s taking my nieces and nephews and my brother is going too. Its all go in our family! I took back the trousers and found some nice other ones. These I tried on at home and they are HUGE. Its nice to feel slim but I swear this size was completely miss-labeled. I checked and it was my size. These will also have to go back. I picked up AM and we went to knitting club. Much fun was had and I gave her and her lovely husband a lift home again. Friday was Scotty’s birthday. I baked him a cake and we went out to the prison ( a great viewpoint place in Norwich) to take a few photos of the view with Scotty’s new wide angle lens We also said hello to Erasmus where we scattered him. He also loves the drawing pens and drawing pad I got him. I paid some towards his lens too. He also got a jelly bean machine from Dad and some coffee cups and a chocolate shaker to go with the coffee stuff. Saturday Scotty and I took cake and flowers to my sister at her new house. They were waiting for their new cooker to arrive. Once it arrived it had to be connected. After some staring at the wiring M finally figured it out and got the contraption working correctly. Hoorah! A brief trip in to Holt for some new magnetic saucepans my sister whipped up a veggie lasagna and baked potatoes. It was perfection and extremely tasty. The cooker past muster and was proclaimed a success. now its taken me over a week to post I have had to keep adding to it to keep up. I’m not sure right now I want to keep this up. I do love blogging but I can see up until the end of March I’m going to be quiet on the airwaves at work. I’m too busy and hoping to enjoy getting my head down and working hard. If I do get blogging time at home as well as catching up with Internets at home I’ll pop by. Just don’t get upset if I’m illusive in the near future. I’ve not forgotten anyone, I’m not hiding because I’m sad. I’m happy, I’ve just got a lot to do and something has to give for me to achieve the things I want. Anyway whats the betting now I’ve said this I’ll blab 3 or 4 posts this week alone. 😉 you’ll just never know and neither will I until it happens. I just have to try to make things happen and sitting here typing a blog post is not getting that other thing done…..
Its been a great weekend. Scotty and I had Friday as holiday and due to my hay fever being rather prevalent we stayed in and watched a whole heap of old films on the TV and I knitted. The films included back to the future 3 and Bill & Teds excelent adventure. I realised both films were produced around 20 years ago, making me 8 years old at the time. That really made me feel old and rather like I was taking a day to step back a few years. Time was spent playing with the cats and all that sort of stuff like washing and cleaning. Sometimes especially when I have hay fever its just nice not to leave the house and to hide indoors. Saturday I did my hair in curls, it was a lot easier than I expected but dropped out in to waves quite quickly. I had nothing to hold the style in my hair. This was all in aid of a hen doo for a work friend. She had a great time and I enjoyed seeing work Friends outside of work for a drink. They all moved on to “sheecargoos” and I got a cab home from the train station. I don’t enjoy heavy drinking and I also don’t enjoy clubbing in Norwich. I think I escaped well as I was informed it was the same as usual, meaning a bit grim. The bbq at the Eagle Pub was great though. Sunday was fabulous weather. We went over to my sisters house for my nephew and brother in laws birthdays. It was great to see all the family and it was a very enjoyable afternoon. We played in the garden and I helped my sister cook a little when I was fed up of itching and wanted to get inside rather than outside. Now bank holidays are some of my favourite times. Amazingly it was very very hot yesterday, Scotty and I popped in to tescos and got a cheap printer. £40 for a canon, and its top quality. It was cheaper to buy that and print cards than to have them done by someone else. After shopping we took a small picnic to Mouse hold hill and sat out in the sun. We scattered Erasmus up on the hill so he could chase the birds and enjoy the view. I’m still missing him. I thought of his long low meows and how special he was. I must admit though when we got home I got a hug off each of our new kitties and it was like they knew he was gone and the both gave really good hugs, something it takes time to learn. I’ve printed out a stack of invites and a stack of RSVP cards. Amazingly I’ve forgotten to place on a RSVP date on the invite card but it is on the RSVP cards. Address is on the invite cards but not the RSVP cards. I’m confused but it looks REALLY nice. I’ve managed to knit all the way past the heel on a pair of socks without taking any photos. yes yes, bad blogger, etc. One day I will catch up. Its not likely to be any time soon. Gosh its already Monday night and I’ve not had time to reprise my weekend. It was great! I achieved.. well sort of. Went to see mum and dad. Mum is suffering a little at the moment with more chemotherapy. It really does knock her about but she still fights on good and strong. She says its like walking up 9 flights of stairs when she just does the one flight and you get that wobbly leg feeling. Also her arms ache when she’s stripping the wall paper, or painting the walls. WHAT?? YOU WHAT? oh why oh why cant she stop? its because it keeps her going. She’d rather ache and get on with it than sit there. I don’t blame her, I just love her and wish that she would take the best care of herself for all our sakes. I’m sure she does really but I’m still shocked she does not slow down that much. Although she has slowed for my mum. It used to be EVERYTHING done TODAY. If it needed fixing she’d be on it. I’ve just GOT to love her. The best mum ever. Then there is dad, he’s looking after her so very very well, I’m in awe at his stamina and ability to deal with the situation. He keeps going when mum cant and takes all the nagging and instruction she can sit giving. I do love my parents so much, they are amazing. Then after visiting mum and discussing catering and all those weddingy type things we went on to my brothers house for dinner and a quick play with the twins before bed time. I was fully amazed to see that Izzy has learned all of her ABC.. Tommy is not so forthcoming but he’s mastered potty training and she has not. They are both so very different! I gave them a bath, which basically meant playing with a bottle making squirty fountains to keep them entertained. They went off to bed and Scotty had a drink (antibiodes and driving duty) otherwise I would have stayed over. The world was put to rights and we took a wonder around the grounds in daylight to look at the new plants and in night light to play with powerful torches and marvel at the sunset from their property. Summer parties are going to be the best from their place. Sunday I rose early thinking I must get some stuff sorted out. I baked a loaf of fresh bread… Just could not resist showing off to my old friend Eve… nipped to the shops, did washing, dishwasher, tidied and generally achieved lots. Scotty went out to take some photos with flickr friends. Eve came over with her beautiful daughter Alys. Alys just loved playing with the cats and throwing quite a hard ball right in their faces. They just took it sort of understanding that she did not know any better. I managed to talk Eve in to doing our wedding cake (its what she wants to do as her own business one day, and she said she would be honoured) which is another weight off my shoulders. Next time she visits she’s going to bring samples. Now is that not just the best visiting present? 🙂 I love her too. I’ve known Eve since I was 17. It was a bit distant for a while but I’m mighty glad we got back in touch. After Eve left for the long drive back to St Albans I sat and knitted. I’ve been out every lunch time with my colleague and friend Di. She’s getting married in May so we’ve visited at least 4 weddingy type shops over the past two lunch times. I have managed to get one thing and I fell in love with it. A necklace for me, to match my yet unmade dress. 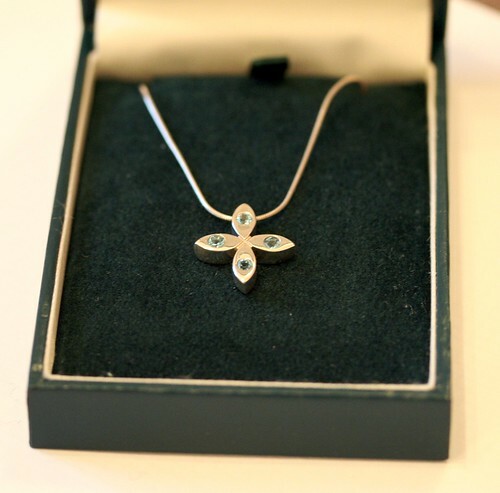 Pure silver with blue topaz. The ideas are building up, style, colour and generally what needs to be done. I am at a loss with several areas. Ive charged Scotty with the honeymoon so its one less thing for me to sort. I’m sure we can put together an itunes play list and keep it low key for music and entertainment. Still it would be nice to have something a little special, its just what. Any ideas welcome. I’m still on a budget so hiring a band is not really what I want. Firstly before caterers and any other things we need to decide who is coming. This is something I’m not sure I want to choose yet, but it has to be done and soon. I was so wiped out yesterday evening from all the running around at work (lots of PC replacements going on) and the walks at lunch and walking home and getting the shopping on the way. I did not pick up the knitting. I feel like its getting away from me. The want to write down a pattern and complete the cable heart cascade socks is burning in the back of my mind but they are still locked in stalemate. I need to make them long even if I want them short, so I can publish a full and part pattern. Erasmus is booked in to the vet for Friday morning and shock of all shocks his leg now appears to be healing up a bit. I’m not going to cancel now. I’d rather be safe and pay for another vets visit than worry about it. He seems happy though spending most of the evening curled next to me. you can have a proper post. I just need to get typing. So Friday night was spent at home instead of going to see Lee Scratch Perry which I’m slightly gutted about but hey, cant win them all and finding out on Thursday night left us too late to get tickets. Next best thing to being there is here. Saturday we packed up for a night at my brothers for his house warming party come birthday party for his wife. There were many old friends attending and even though we have 8 years between me and him I had a fair few years where his friends were my friends too when I moved to Norwich alone at 18. I bought some booze over and Scotty spent nearly the entire evening by the fire in the woods. He helped start the fire and as the night went on ALL of the attending men took turns in tending the fire. Almost the entire evening was spent by the fire until around midnight when the remaining people who were sleeping over all went for a game of table football. All drinkers had a fair skin full and a fun night was had by all. All the photos I took turned out a bit rubbish so I’ve not bothered putting any up yet. Paul and Becky (brother and wife) had spent a lot of time in their garden cutting down all the rubbish and thinning out their very over grown garden. EVERYTHING burnable was burned. Sunday was spent recovering, and I was mean enough to mention to all the others that I could spend it on the sofa relaxing whilst they all had small children to attend to. Sometimes I’m quite happy not to have kids, especially with a hang over. Monday was back at work. Le sigh, its good at the moment though because I feel refreshed by the holiday.